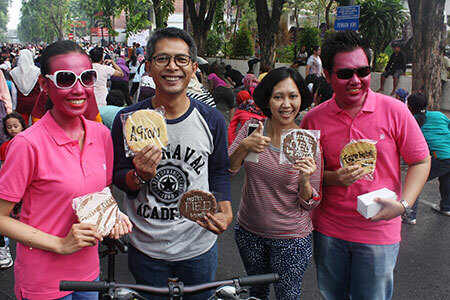 Jakarta, November 2015 - Archipelago International, Indonesia's leading hotel management company, showed its support for a cleaner, fresher, and healthier environment by bringing its brands to the Car Free Day in Surabaya. To demonstrate the car-free movement, Archipelago International joined the FAN-Q Walk that encouraged the community to ditch their cars for a day and take to the streets by foot. Joined by over 70 staff members from Archipelago International’s properties in Surabaya, such as favehotel MEX Surabaya, favehotel Graha Agung, favehotel Rungkut, The Alana Surabaya, Hotel NEO Gubeng, Quest Hotel Surabaya, and Aston Bojonegoro, the walk started on Jalan Raya Darmo and finished at Surabaya Zoo, which covers about 1,5 kilometers. During the walk, the Archipelago staff members wore colorful outfits that showcased the individual identities of their associated brands. They also distributed cookies with the hotel brand names and gave people the chance to take social media selfies with the “Pink Lady” – the popular face of favehotels – as well as "The NEO Girl" who acts as guests' personal assistant in NEO hotels. Archipelago International also hosted Surabaya's Cycling Community for a coffee break and breakfast at Quest Hotel Surabaya. "Archipelago International has a number of properties located in Surabaya - some that already exist and others that will be opening soon, such as Hotel NEO Gubeng and favehotel Rungkut Surabaya. The hotels cover the budget, family and business markets across our favehotel, Aston, Alana, NEO, and Quest brands - each one with their own distinct characteristics. The FAN-Q Walk for Surabaya's Car Free Day was therefore a great way to bring our brands closer together, and to let the public experience Archipelago International's signature hospitality." said Tenaiya Brookfield, Vice President of Sales & Marketing at Archipelago International.